Extended Wear is a type of soft contact lens which is available in an overnight lens (worn during sleep) and all day wear (up to 18 hours) . The introduction of Silicon Hydrogel materials has allowed such a lens to be created that is safe, comfortable and convenient. Ciba Vision has created a range of Extended Wear lenses to fit this lifestyle choice in contact lens wear. 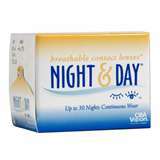 NIGHT & DAY™ are the contact lenses you can wear continuously for up to 30 nights and days. Up to 30 days of continuous, natural vision means complete day-to-day freedom – no daily insertion and removal, no cleaning and no lens care product expense. Long hours at work, air conditioning and pollution can all potentially cause eye irritation and discomfort. If your contact lenses can’t deliver enough oxygen to your eyes, they may not recover quickly from times of stress. Now, something is about to change the way you look at contact lenses. It’s O2OPTIX, breathable contact lenses with up to five times more oxygen transmissibility than traditional daily soft contact lenses – for whiter, healthy-looking eyes, no matter how long you wear your lenses each day. They’re so breathable, you can nap in them or even sleep in them for up to six nights extended wear.